Coming from the north or the east via the A67 motorway, take the exit N° 7 at Agen. Immediately after passing the toll gate, turn left and follow the D931 for 38 kms until Condom. Pass through the town, following the signs for “Eauze” and “Pau”. Halfway through the town, you will cross the river Baïse (see picture) and about 100 meters after the stone bridge you will come to a roundabout. Take the left hand exit and after about 400 meters you will see on your left hand a hardware store “ OUTILMARCHE”. Right opposite this store take the road on your right, the D114, following the sign “Fourcès 12” (see picture). 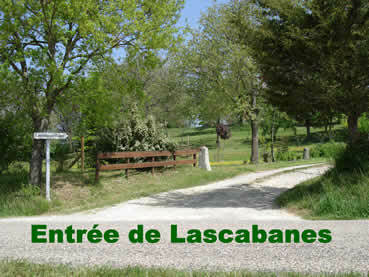 After 2,8 km, you will find the sign “Lascabanes Ouest”, marking the entrance to your holiday spot. Should you need help, please call us on 05 62 28 35 01 or 06 86 03 82 06 (mobile).